For a comforting broth beverage with the added nutritional benefits of Beetroot, add a heaped teaspoon of Beef Bone Broth with Beetroot powder to a cup (200ml) of boiling water. Once made up in liquid form it can be used as a soup base, added to dishes such as casseroles and gravies, or as a base to braise vegetables. Use 5 teaspoons to make 1 litre of stock. 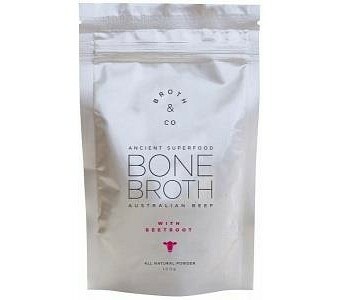 Ingredients: Bone Broth Powder 95%, Beetroot Powder 5% NOTE: Store at 25°C. Reseal once opened.